Great for school projects or just for fun! 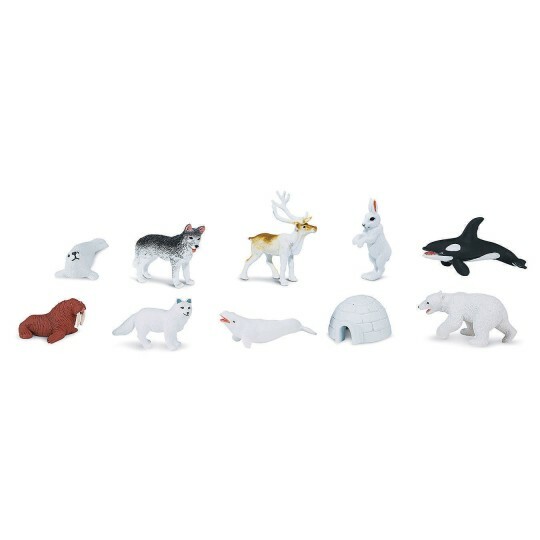 Contains 10 figurines that range from 1-1/4” to 3-3/4” tall. Like almost all Arctic animals, creatures like the polar bear, Arctic rabbit, and Arctic fox have snowy white pelts that allow them to evade detection from prey and predators alike. Great for school projects or just for fun. Neatly packed in a reusable acetate tube. Phthalate-free and thoroughly safety tested. The children love these animals. We use this in a child care center so this is used amoung multiple age groups. This was bought for our summer camp program for school age. They spent hours being creative with the animals. I will be using these for my Summer Camp program. the Week we are learning about the Arctic. I plan on doing a scavenger hunt with these animals4 sets. I a semi dark room the animals will be scattered around the room with a letter. one child at a time will go in the room with a flashlight to find one of the animals.. they have to find each of the animals and solve the word puzzle. Needed them for our VBS preschooler class. Just the right size and shape. I bought this product for my sons project and it was perfect!! !